While enjoying one of Avery Brewing's high-gravity beers recently, I began to wonder just how hard it would be to brew a beer in excess of 16% alcohol by volume. The best I've managed to date has been a Belgian-style dark strong ale that came in at 12.8% ABV. Could I really push yeast to deliver a beer (in this case a hybrid of mead and beer) at 16% or higher ABV? I wanted to find out. Some sources suggest aiming for an OG of 1.106 initially. Others suggest keeping it to 1.120. White Labs, in its notes for WLP099 Super High Gravity Yeast, suggests a lower gravity - something that would produce a 6-8% beer, and adding fermentables later. Wort pH during the mash should stay between 5.0 and 5.3. Be sure to increase the amount of hops used to offset the higher gravity and sweetness of the alcohol you'll be generating. Add nutrients, adjuncts, and fermentables as the yeast chews through them. Keeping the wort well-aerated during the first 24-48 hours is critical. Pump or agitate the wort during fermentation to keep yeast in suspension, increase oxygen in the wort, and allow CO2 to be released. Adding glucoamylase and/or papain during fermentation can help keep the yeast going and provide additional fermentable sugars. Keep pH between 4.5 and 5.0 during fermentation. When the yeast has attenuated two-thirds of the sugars, stop adding nutrients and oxygen. Beers over 16% will taste more like fortified wines than beers. Fermentations will stall in the 12-16% range without the techniques below. Aerate intermittently during the first 5 days of fermentation. With air, aerate for 5-10 minutes. With pure oxygen, aerate for 30 seconds. Use twice as much nutrient as normal. Higher nutrient levels allow the yeast to tolerate higher alcohol levels. Do not start with the entire wort sugar at once. Start with a wort that would produce a 6-8% beer, then add concentrated wort and/or sugars daily for 5 days, ideally along with aeration. In a nutshell, my plan is to begin with a yeast starter to grow the yeast population. Then I'll add the yeast to a strong wort to allow it to start going, adding honey or another fermentable until my target ABV is reached. From there, the yeast will be allowed to finish out on its own without further addition of fermentables, nutrients, or oxygen. Since the goal here is more to see if I can successfully brew a beer that comes out above 16% ABV than to produce the tastiest high-alcohol beer possible, I'm working to keep the recipe extremely simple. If the experiment is a success, I'll consider how to make a more-tasty beer at this alcohol level. I knew from my reading that this beer would need more attention during the fermentation stage than any previous beer I'd done. I'd need to keep an eye on temperature and gravity, add nutrients and additional fermentables, periodically aerate it, etc. That meant I could only attempt this experiment when I'd be home for a few days to take care of the beer. I ordered some liquid glucoamylase enzyme so that I would have it on-hand to add to the wort as needed to help with fermentation. 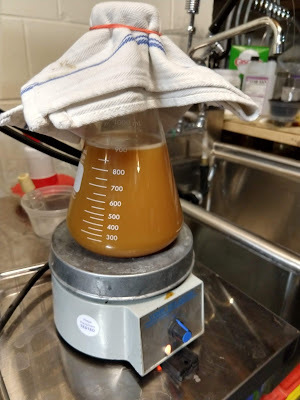 I planned to be home most of the week of Thanksgiving 2018, so I created my yeast starter on Monday evening after coming home from work. It would be ready to use within 12-24 hours. I would brew the beer on Tuesday, and pitch the yeast when the starter was ready. I'd be home for at least the next five days, so I'd be able to keep it on track if need be. For the first 24-48 hours of the beer's "life" I would need to keep an eye on its temperature and gravity, so that I'd know when to add more fermentables and yeast nutrient to the fermenter. Once a 67% attenuation was achieved, I could allow the yeast to finish out on its own. Actual Original Gravity: 1.139 SG initially. After dilution with distilled water and adding yeast starter liquid, gravity was estimated to be 1.116 SG and volume 1.20 gallons. You'll note that I've decided to ignore one of White Labs' recommendations and start with a wort in the 1.120 SG range. If the experiment fails, I'll plan to do a second experiment and follow that advice. No mash schedule and no steeping needed for this batch. Since I'm not worrying about this beer going into a competition, or even being especially tasty, I've decided to chill it by placing the fermenter atop an old milk crate and placing it outside in the 36F November weather. Since the yeast starter isn't ready yet anyway, the extra elapsed chilling time should not impact the brewing. Once the yeast starter is finished and the wort is at an acceptable temperature, I'll decant most of the liquid from the yeast starter, swirl the slurry around to loosen it from the beaker, and pitch the yeast into the fermenter. A magnetic stir bar and Tilt Hydrometer will be placed into the fermenter as well. Instead of an airlock, I'll use a cotton wad in the fermenter at this early stage to filter out wild yeast and allow the free flow of oxygen into the wort and the expiration of CO2. For at least the first 24-48 hours, I'll have the fermenter atop the magnetic stir plate and have the stir plate running to ensure optimal aeration and degassing during the yeast's initial growth. If the temperature gets too high, I'll move the fermenter (and probably the stir plate) outside to make use of the cold ambient temperatures for temperature management. Periodically, I'll stop the stir plate and check the Tilt Hydrometer's gravity readings. When the gravity is down to approximately 1.063 SG according to the Tilt, I'll pitch in a pound of wildflower honey, 0.25 tsp. of glucoamylase enzyme, and another 0.25 tsp. of yeast nutrient and switch the stir plate on for 10-20 minutes to mix in the new fermentables and yeast, and aerate the wort a bit more. I will periodically switch on the stir plate to ensure off-gassing of CO2 and introduction of oxygen to keep fermentation on track. 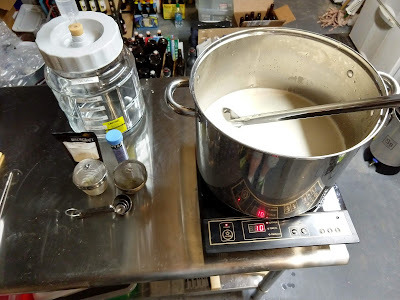 When the gravity drops down to around 1.050 SG, I'll replace the cotton wad with a sanitized airlock filled with distilled water to allow CO2 to build up on top of the beer and prevent further oxygenation. If the beer's still outside at this point, I'll bring it in to let it finish out at ambient temperatures indoors. Once the airlock is on, I'll do no further stirring or oxygenation unless the fermentation seems to stall. I'm hopeful that this plan will allow the yeast to bring the wort down to at least 1.031 SG. At that point, we should achieve an ABV of 17.85% or higher - making this the highest-gravity beer I've ever brewed. From what I've read, beers this high in alcohol content typically don't smell or taste particularly great. They often need 6-12 months to condition and improve. That being the case, I plan to extract a small sample of wort after primary fermentation to check aroma and flavor at that point, and take notes. It will then be time to bottle. I then plan to take some CBC-1 Cask and Bottle Conditioning yeast and rehydrate it. I'll add in some kind of sugar to kick-start it fermenting. While it's activating, I'll get the beer into bottles and add carbonation drops to prime it. Then I'll inject some of this active yeast slurry into each bottle to give the beer the best chance to carbonate. For the first couple of weeks, I'll invert all the bottles daily to keep the yeast and priming sugar in suspension and (hopefully) carbonate the brew. Somewhere around Christmas, I'll chill a bottle and pop it open to see where it is in terms of carbonation, aroma, and flavor. From there, I'll make a decision as to whether the beer needs to continue to age. I'll also think about what I might change in a "version 2.0" of the experiment. I'll have time in December to brew that one if I choose to. 11/20/2018 1pm: The wort came up a bit short in quantity and high in gravity (which I expected), so I diluted it with some distilled water until I hit the target gravity - or at least as best I could measure. The refractometer read in excess of its 1.120 SG maximum, but judging by the position of the line it appeared to be about where 1.126 SG would have been (had it been marked). I placed the wort outside in the 36F weather to chill to a yeast-safe temperature. When it's within the Tilt Hydrometer's operating temperature range (32F to 185F) I'll use the Tilt to get a "second opinion"... although the Tilt is reportedly only accurate up to about 1.120 SG as well. The yeast starter won't be ready for at least 8-10 more hours, so my plan is to chill the wort down below ambient room temperature in the basement, then transfer it into the sanitized glass fermenter I'll be using. The sanitized Tilt Hydrometer and a magnetic stir bar will be placed in the fermenter. The yeast will be decanted from the starter and pitched as well. 5:30pm: The wort is down to 62F and registering 1.139 SG, quite a bit higher than we want. The yeast starter was pitched at 11pm last night, so it's been fermenting for about 18 hours now. 8:00pm: Gravity has been registering 1.137 SG since the wort hit a yeast-safe temperature. I added distilled water to bring the gravity down to 1.120 SG. I tried activating the stir plate in the fermenter but failed to get it in the middle of the fermenter (owing to the shape of the fermenter bottom, which is angled away from the center), which prevented it from stirring as it should. I ended up oxygenating the wort with 90 seconds of pure O2 instead. 1:43am: The yeast starter has had plenty of time to do its work, so I pitched it into the wort. The gravity is reading 1.096 SG, but there are clear "layers" in the fermenter so I'm not certain of the exact gravity. I'll now need to increase the amount of fermentables added later to compensate. If the current reading is correct, ABV will be only 9.7%. 11/22/2018 10:30am: Fermentation has been underway for a while now. A curious thing has happened. The gravity initially read 1.098 SG and dropped down to about 1.077 SG during the night. After that, the gravity started to climb and is currently reading 1.093 SG. I took at a look at the fermenter and it's definitely at high krausen now. My suspicion is that when I pitched the yeast starter into the wort, it did not fully incorporate and remained as a layer atop the rest of the wort. This caused the gravity to read lower than it should have. The Brewer's Friend recipe calculator seems to concur with this, suggesting that the gravity (given the ingredients and volume) should have been around 1.105 SG at the start of fermentation rather than 1.098 SG. I'm guessing that the high rate of fermentation is churning up the wort now and mixing it together more, resulting in increased gravity. It may also be that the krausen foam is affecting how the Tilt Hydrometer is floating. Regardless, later today I plan to sanitize a stainless steel spoon and stir the wort around to keep the yeast in suspension, off-gas some CO2, and better homogenize the wort's gravity. I'll also probably oxygenate it. When I see the gravity reading, I'll decide if it's time to start adding honey to the fermenter. My goal is to add enough to bring the alcohol content to 17% or more. 11:30am: I sanitized the stainless steel spoon and stirred the wort thoroughly before and after adding 1/8 tsp. yeast nutrient and 1/4 tsp. glucoamylase enzyme. Then I oxygenated it for a few seconds. The gravity reported by the Tilt Hydrometer dropped briefly after the stirring and then continued its climb, eventually reaching 1.100 SG. For about six hours now the gravity reported by the Tilt has been increasing (from 1.077 SG to 1.100 SG as of this writing). Given how quickly the krausen is rising in the beer, I'm guessing that's probably buoying the Tilt a bit and skewing its reading. 12:30pm: The gravity peaked at 1.100 SG (per the Tilt Hydrometer) at approximately 11:45am. It's now dropping back down and is at 1.096 SG as of this writing. 11/23/2018 9:00am: Over the last 28 hours or so, the gravity readings from the Tilt Hydrometer have been moving upward for several hours, then down again. The current reading is 1.062 SG and the temperature is 66F. That equates to roughly 44.8% attenuation and a current ABV of 6.8%. My plan will be to keep an eye on the measurements today. When attenuation reaches 65% or so, I'll crack open the fermenter, add 1.75 pounds of honey, yeast nutrient, glucoamylase, and stir thoroughly to help release CO2 and incorporate the honey, then oxygenate for a minute or two and reseal the fermenter. From there I won't plan to add anything to the wort again until fermentation finishes. 1:00pm: The gravity dropped down to 1.057 SG. I added almost a pound (0.9 pounds) of honey, 0.125 tsp. yeast nutrient and 0.25 tsp. glucoamylase enzyme, and then oxygenated for 30 seconds. Gravity increased to 1.081 SG and the krausen rose back up quickly after the additions were stirred into the beer. Temperature has held at 65F for some time now thanks to the swamp cooler. 9:00pm: Gravity is now 1.068 SG and the temperature is holding at 65F. By my best guess, this represents approximately 10.37% ABV. We're not yet at my current record (12.84%) or my goal for this batch (16% or higher) but we're getting closer. 11/24/2018 12:00pm: Gravity is down to 1.058 SG again, which equates to 11.6% ABV and 60% apparent attenuation. It will be time to add another pound of honey soon, so that the beer can achieve its intended 16% or above ABV. 2:15pm: Added 1.2 pounds of honey, a quarter teaspoon of glucoamylase, and an eighth of a teaspoon of yeast nutrient, then agitated everything in the fermenter. The yeast responded swiftly, with a huge swell in the krausen. This is the last fermentable addition I plan to put in the fermenter, but if the yeast is able to consume all this sugar, the beer should come out in excess of 16% ABV. Prior to the additions, the Tilt registered the gravity at 1.056 SG. After the additions, it's reading 1.073 SG. 5:15pm: The yeast looked like it might be going dormant, with the gravity having dropped to 1.066 SG. Since I'd wanted oxygenate it earlier but did not, I took a moment to give it 30 seconds of O2 to help keep the yeast healthy. The Brewer's Friend ABV calculator offers two different ABV calculations, a "standard" and an "alternate" version intended for high-gravity beers. The standard calculation rates the beer right now as 13.65% ABV (making it the most-alcoholic I've managed to date), while the alternate calculation (which should be more accurate in this case) shows it as 17.56%. If you figure that reality is perhaps a mix of the two, the beer is around 15.6% ABV. That puts it within spitting distance of my 16%-or-higher goal. It's also still got a fair amount of sugar to ferment out before it's finished. It could end up as high as 18.78% according to Brewer's Friend. It's got to ferment another 35 SG points away to reach that. 11/25/2018 11:15am: The fermentation has definitely slowed. It's currently registering 1.062 SG, down from an adjusted 1.170 SG (which takes into account additions of honey in primary and increased volume). The "standard" Brewer's Friend ABV calculation here says that's 14.17% and 60% apparent attenuation. The "alternate" calculator that's said to be more accurate for high-gravity beers like this reports 18.17% ABV. The average of these is 16.17% - which is my goal for the batch. My plan at this point is simply to keep an eye on the beer and ensure that it continues to ferment. In a few days, I'll transfer it to a clean and sanitized secondary fermenter to get it off any sediment and dead yeast, and let it continue to rest a bit before I consider bottling it. Given this success (from the standpoint of reaching my ABV goal), I'm already planning another high-gravity brew. The next one is intended to come out in the 15% range and will probably be based on a British Old Ale recipe, with scaled up gravity and bitterness. Or I might aim for a Belgian Quad, scaled up similarly. We'll see. 11/26/2018 8:50pm: The gravity has been registering 1.061-1.062 SG for a little over 24 hours. Assuming an initial gravity of 1.170 or thereabouts, that's 18.3% ABV according to the alternate calculator on Brewer's Friend. Tonight I swirled the fermenter a couple of times really hard to help release CO2 and keep the yeast in suspension to see if it would help reduce the gravity any further. So far, it looks like we might have hit the final gravity on this one. I noticed when doing the last honey additions that the Tilt Hydrometer had lots of "gunk" on it, which may be affecting the reading (by making it tilt more or less than it should). We'll see when I have a chance to transfer the beer to a secondary fermenter and (in the process clean up the Tilt). 11/27/2018 9:20pm: The beer dropped to 1.059 SG overnight, which equates to 18.6% ABV. That makes it by far the most alcoholic beer I've ever brewed. I couldn't resist taking a sample of it with a sanitized pipette to see how it tastes. I have to admit that I was surprised. At first, it strikes you as rather sweet and boozy, but almost immediately a hop bitterness comes up to balance that. It's something you're not going to gulp down, to be sure, but it seems quite drinkable already. I'm looking forward to this one finishing out and going into bottles. With a bit of conditioning time, I suspect it could be really good. Right now it comes across as a fairly boozy pale ale with a mandarin orange note malty sweetness. 12/1/2018: Gravity is continuing to drop, thanks to the mix of champagne and WLP099. It's currently registering at 1.053 SG. Brewer's Friend reports that this represents a 19.5% ABV. 12/2/2018: Gravity is now 1.051 SG. Brewer's Friend reports this as 19.81% ABV and 67% attenuation. 12/3/2018: Gravity is now 1.049 SG. Brewer's Friend reports this as 20.1% ABV and 68% attenuation. 12/4/2018: Gravity is now 1.048 SG, 20.25% ABV. 12/5/2018: Gravity is now 1.047 SG. 20.4% ABV. 12/6/2018: Gravity is now 1.046 SG. 20.54% ABV. 12/8/2018: Gravity is now 1.045 SG (20.69% ABV). 12/9/2018: After swirling the yeast around today, the gravity is reading 1.046 SG now. 12/10/2018: Gravity is holding at 1/046 SG. 12/12/2018: Gravity is reading 1.045 SG (20.69% ABV). That's about 6 days now in the 1.045-1.046 range, so it seems likely that the beer has reached its final gravity. I still plan to give it a few more days to see how it goes.